Aston Villa chief executive Tom Fox says manager Paul Lambert has the full support of the club and remains important to owner Randy Lerner. 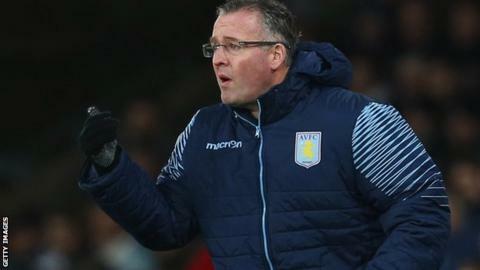 Villa have taken only 12 points from their last 18 Premier League games, but Fox told BBC Sport sacking Lambert mid-season would be like "flipping a coin". "When things aren't going well, fans bay for that type of blood," Fox said. "That's not the way that I or the owner are going to make a decision. It's a false narrative." Villa have scored only 97 goals in 98 games during former Norwich City manager Lambert's time in charge. But Fox defended the statistics and believes Villa's players are close to delivering on their hard work on the training pitch. "I think football's a funny business and I think to put it all on the manager, again, that's a bit of a false narrative," he added. "There's a lot of things happening at this football club, and clearly what happens on the pitch is a focal point. "Clearly the manager is the one person who can really influence that, so everyone focuses on it. "Our focus for the last couple of months has been on making sure we support Paul to make us as successful as possible, and I think we're heading in the right direction." Villa, who made a good start to the season with 10 points from their first four games, are 15th in the Premier League table, just three points above the relegation zone. Fox, who joined Villa in August after five years as commercial manager of Arsenal, said American owner Lerner was "having fun with the club" despite putting them up for sale last year. "He's very involved in the football club, he watches every match," he said. "I've been at his house watching matches together and both of us are standing up pacing around at various points of time - depending on what's happening - so he know's what's happening here. "He's very, very well informed as to the business side of what's happening on the pitch," he added. "I don't think he's a motivated seller right now. I think he'll want to make sure that he's put Aston Villa on the best possible path for the future." Is Costa becoming a divisive figure?